I though about burning the book for all of a nanosecond, but decided against it. “Go on. Quickly, while there’s still time. Burn it. Don’t look at another word,” Jakabok urged. Again I decided to read on. Yeah, yeah. The damned book cost me £7.99 so there was no way I was going to burn it. I read on. Mister B. continues to plead for a book burning all the way through the book and he is willing to try any means at his disposal to get what he wants. He begs, he offers bribes and he even threatens the reader (demons can be so nasty). In between doing all of this Mister B. also gives the reader an insight into his life, beginning in the Ninth Circle of Hell and ending with how he got himself into his present bind. The reader learns how Mister B. was disfigured, the way he was hauled into our world against his will, and all about his first and very brief love (it ended very badly for the girl in question). Mister B. also reveals how he met his great friend and soul mate, fellow demon, Quitoon Pathea. Mister B. 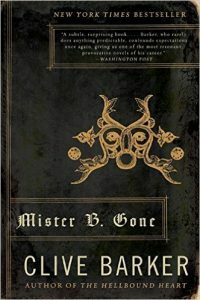 Gone is 250 pages long and is rather an unusual story, but although it is quite an entertaining read, I must admit that I did not enjoy the book as much as some of Clive Barker’s other work. Possibly because I find it hard to identify with a character that is a demon. The book contains some rather nasty scenes, and with flesh falling off bones etc., they are worthy of any horror novel. This is a book though, that might be more appealing to readers who prefer fantasy novels because the world of Mr. B is not easy to relate to (it wasn’t for me, anyway). It is a world where people go fishing for demons and then skin them alive after they have caught them. It is also a place where the process of barbecuing a Bishop is not an entirely unheard of thing. It is a well written story, but I never really got pulled into it. That is okay though, because the book already has poor old Jakabok and I still have no intention of burning it. Sorry Mister B.